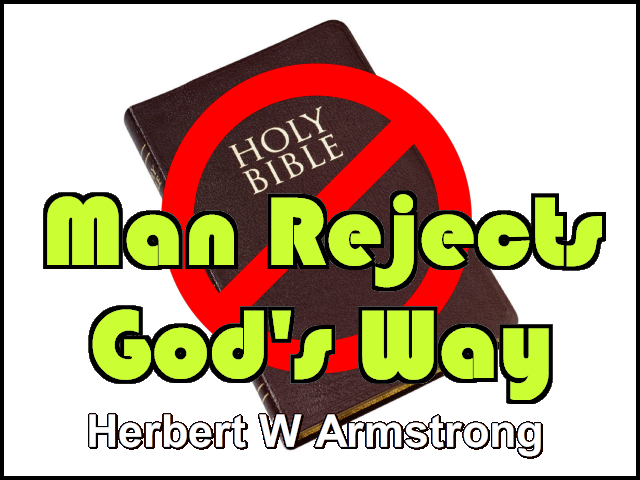 Well, greetings friends, this is Herbert W. Armstrong with the Good News of the World Tomorrow. And again, we could have good news today if we knew the way. There's only one reason why we're having all of the troubles, the wars, and everything we have and that's because we don't know the way to peace, to prosperity, to happiness, to every thing we want. That way has been revealed, the way has been made known, and men have always rejected it. As I've mentioned so many times God Almighty revealed that way to our first parent. He turned his back on it, he turned the other way. It was revealed through Noah at the time just before and after the Flood but men soon after the Flood began to go the other way again. It was revealed by God through all of His prophets but men stoned the prophets and rejected that way. God sent the message of that way by His own Son — Jesus Christ. Men took His name and appropriated it. They went out in His name and tried to appropriate His authority but they rejected the message and they crucified Him. That's what men have done to the way that would bring them everything they want and then they wonder why they have the heartaches and the headaches and every other kind of ache and pain and suffering and unhappiness that we find on the earth today. Now, we were looking through this ministry of Jesus Christ and how He was sending His disciples while He was teaching them... A disciple is a student or a learner. And while He was teaching them before they became apostles that is ambassadors with full credentials and authority to represent the Government of God on this planet Earth. Jesus was sending them out on a practice mission as it were. And as I was explaining in the preceding broadcast, I was giving you a number of things in which the teaching of Jesus and the way was entirely different, in fact, just the opposite of that which you see today. And so, let's see if we can pick up here where we were. Jesus Himself had gone about all of the cities and villages teaching in their synagogues and preaching the Gospel of the Kingdom. Now, people preach even about the Kingdom today, but very few seem to know what it is. They aren't preaching that today. And so that was the first thing that we saw that is different today. They are preaching a different gospel. Today, the gospel is just to make the name of Christ known. They preach about Christ. They tell about Him, how great He was. They deify Him but His message they reject. Now, some claim to even preach the Kingdom of God but they don't seem to know what the Kingdom of God is. Very few people seem to know that the Kingdom of God is the super reign of God over all the universe. That God is that Kingdom. And that Kingdom is a great Family. And there's a Family relationship. There is God the Father. Christ was the Son. There is a Family relationship. And God is not one Person but is that Family which reigns and rules — the Creating Family — who created not only static or dead matter but God created forces and energies and powers and laws and set laws in motion and God rules by those laws. But for God's purpose in order to work out His purpose here below God has made man a separate entity, a separate character free to have a mind of his own and to make his own decisions and to act according to his own volition and to reject God and God's way and God's rule and Government over his life if he chooses and that's exactly what man has always done. Man seems not to have had enough of the powers of God and of the wisdom, the knowledge of God in his mind to have realized that only God's way and the way that God thought out and designed and set in motion according to His laws, only that way can bring us any peace or happiness or anything else. Now, God gave the great spiritual Law of Love. And that's love to God and love to neighbor and it's the way to peace and happiness. But man just has come short of the, not only the glory of God but also of the knowledge of God and of the powers of God. It's a very fortunate thing for us that God did not give the human family all of the power of God. Look what man has done with the powers at his disposal. Now, I've pointed out so many times that man is the only being, the only creature that we know short of God or under God who has the faculty, the power of mind of being able to think, to plan, to reason out something, to design and plan something and then to carry it to execution and to perform it, to build, to accomplish. Nothing else that we know of can do that. And look what man has done with what power he has. He has turned it into inventions of powers of destruction — to destroy, to tear down, to conquer, to go out in wars of conquest, to take away from others, to cheat, to steal, to exalt himself in vanity and so we have in human nature — vanity (or pride) and greed or extreme selfishness. And that has actuated mankind from Adam down to now. Now, Jesus Christ came proclaiming the way of God which is the Government of God and God governs by His Law which is humility — surrendering the self to God. Recognizing and having the good sense to know that the Law that God thought out and planned and designed and set in motion is the only right way but man can't see that. Man doesn't agree with God. Now, Jesus came preaching that way. And the Kingdom of God is the Family of God that is the Creating Family and the Ruling Family. And Jesus taught that we could be born into that Family and become a part of it ourselves, in other words, the God Family — the Kingdom of God, because it is a Family grown into a great super all-ruling Kingdom. Now, God is allowing mankind to do as he pleases, to make his own mind and to decide as he pleases to reject God if he chooses which man has done but, my friends, God has allowed that for only a limited duration — just six thousand years and that six thousand years is now going to end in our time, in this present living generation. This generation shall not pass until God sends Jesus Christ as the King of kings, the Lord of lords to take over the rule and to reign and rule by supreme divine supernatural force over every nation on earth. It is matter of fact, every government devised by man is soon going to be shattered — all of these governments over which men fight wars, all of these isms that have been springing up in a world revolution in our time are merely human ideas of government — every one of them contrary to God's Government. It's all a usurpation of power which God, of course, has allowed. But the time of allowing that is about up and then God is going to intervene and step in and save humanity from himself and God is going to take over the rules of government and every government on the face of this earth is soon to be destroyed. Now, Jesus came preaching that. And then He sent His disciples out on this practice mission. He gave them power and authority over demons and to cure diseases or to heal. And He sent them forth to preach the Kingdom of God. My friends, the Kingdom of God is the super-ruling Kingdom — as the Kingdom to which we must yield and obey and that God rules by His laws and that God has revealed His laws. And Jesus said that man shall live by every word of God and that's the Bible — it's written in the Bible — we have the word of God and the Law of God written in writing. And it is the Holy Scriptures — the Bible. And all the Bible is a magnification of that way so that we should live by every word of God but men don't do it. And you don't find much of that kind of preaching. When? When will man's dreams become reality? What would it take for the Arabs and Israelis to lay down their arms? What would it take for Russia and China to become allies? What would it take for all nations to forge their armaments into farm tools? The whole Gospel of Jesus Christ is about a soon coming world Government that will bring world peace. For a full understanding of this message of hope, request your free copy of "What Do You Mean...the Kingdom of God?" Read how mankind will learn to forge his swords into plowshares. Request "What Do You Mean...the Kingdom of God?" Today, they say just accept Christ, that's all. There are no works, no obedience, nothing of the sort, just do what you think is right; just don't violate your own conscience. Well, men's consciences play some very peculiar tricks on them sometimes. That is not the Gospel that Jesus sent His disciples out to preach. So there's the first place. And to heal the sick — let's say that's the second place because not very of the ministers of the churches today do that. Some do but they don't do it the way Jesus did or the way the apostles, they make a healing show. They call a certain healing service and they parade the people with their crutches and this and that down. They even have them go and get an ambulance and bring the people to the great minister or the preacher who is too dignified and tries to impress the people that he is too great to go to the home or the hospital or wherever it is and just anoint the person and pray for them as Jesus did and as the disciples did and have them healed that way and as the Bible says to do. If you're sick, the Bible says, call the elders of the Church. It doesn't say let the elders call you. It says for you to call them. And where the apostle Paul couldn't get to everybody, he sent out pieces of cloth over which he had prayed, which he had anointed and on which he had laid his hands and that too is permissible because God honored it through Paul but let's find how God did these things and not the way men are doing today. Now, here's the second thing as I had in yesterday's program. Jesus said, "Go not in the way of the Gentiles, enter ye not into the city of the Samaritans." And there were Gentiles there in the land of Samaria. "But," He said, "go rather to the lost sheep of the house of Israel." The churches the ministers don't do that today. They don't believe in that. They say well you know the law that was for Israel but we're not Israel, we're Gentiles. In other words, they imply Christianity is a Gentile religion. Now, Jesus said don't go to the Gentiles, go to the lost sheep of the House of Israel. And then as you find prophesied in the thirty-fourth chapter of Ezekiel... He sent them out to the lost sheep of the House of Israel and the ministers today should follow that same identical commission but they have not sought the lost sheep that were lost. Neither have they found them nor bound them up and yet they have ruled them because they were right among them and didn't know it. They don't even know who the lost sheep of the House of Israel are. Now, Jesus sent His ministers out to the lost sheep of the House of Israel. I don't believe I know of...well except one type of organization that isn't exactly a sectarian denomination in itself that even knows anywhere who the lost sheep of the House of Israel are and even they do not how to apply it and don't know too much about the Gospel of the Kingdom even though they proclaim a Kingdom message so-called. Oh, my friends, it's time to wake up. They don't seem to know about the Government or the Law of God. They don't seem to know why Israel was lost. They don't seem to know what was the sign between God and Israel that would have identified them and when Israel rejected that sign they became lost. But when Judah continued to observe that sign and to keep it, it tagged Israel all over them and the people think that the people think that the Jews are Israel today when they are not, they are the Kingdom of Judah or a part of what is left in the...today in today's generation of the Kingdom of Judah because they have the identifying sign that would identify them as God's people. But Israel rejected that sign and the world thinks that Israel are Gentiles and the Israelites themselves think they're Gentiles. They are not Jews they never were. Oh, how little we know of God's Word and of the Truth and the Bible today. Well, now here's the third thing or really the fourth I presume I should say. He says, "I send you out as sheep in the midst of wolves." And we discussed that yesterday. The preachers today aren't sheep in the midst of wolves. In other words, the ones you preach to are a lot of wolves they're going to pounce on you if you preach the Truth to them, tear you apart. Now, the congregations don't pounce all over their preachers and tear them apart today. They welcome them because as I read to you yesterday, the people will not hear the law of the Lord; they don't want any of God's law. They want a preacher to say, "Christ nailed it to the cross." That's so pleasing to the people. Well, as I've told you before a man said in the early days of my ministry, he said, "Brother Armstrong, you're never going to go far." (I've mentioned this a number of times.) I said, "Why?" And he said, "Because you preach the truth of the Bible. And that corrects and reproves people and rebukes them and they don't like it and they won't support it." Well, then I said, "I'm not trying to serve people. I don't look to people for the money. I look to God." And you know a five dollar bill was so big in those days it was a fortune. That was back in the Depression when it was really bad. And that's back in 1933. I just had to look to God because He's the One I serve. You know if you know who you work for they're the one that pay you a salary. If you work for a certain manufacturing corporation, you don't go over to their competitor and say, "Now, you pay me the salary, while I work for your competitor." And if you work for a man, you have to work for him. And you know most of the preachers are working for the people in their congregation. The people pay the salary and they have to preach what the people want. But you know I don't work for the people. I work for God Almighty and I have to preach what He wants preached otherwise He won't send enough to keep the Work going. Well, it's been a test of faith. God does try our faith. Now, He says He does that and He has done that all through the years. But somehow He has sustained the Work. We're in another test of faith right now. One of the heaviest we've ever had. But you know I'm not worrying about it. I know that somehow God is going to supply every need for His Work. He always has. He always will. He will never let us down. I know that. Well, let's come on now to the next thing. Here's the fifth thing that is different as we were going through this. Jesus said to "Fear not him that is able to kill the body but not able to kill the body but not able to kill the soul, but rather [now listen] fear him who is able to destroy both soul and body in [Gehenna Fire]." You don't hear that today because that Jesus said that there is a man to fear who can destroy the soul. Why, they tell you today the soul is spiritual, a soul is indestructible. The word soul comes from the Hebrew word "nephesh" and it's the life of animals, animals that have their life by blood which certainly can be spilled as Jesus was on the cross for us and who receive the oxidation of that blood by the breath of life. And the breath can be shut off and stopped and then you die. Now, they don't teach that today, they teach today the immortality of the soul. Jesus didn't. Jesus never taught the immortality of the soul. Jesus taught the sinner will die in his sins. He said if you...except you repent you shall all die in your sin. And in the Bible the wages of sin is death. Not eternal life whether it's in hellfire, in heaven, or any other place or in any such condition, but death. And that death is for all eternity. It is eternal punishment but the punishment is death, not life. Let's get that straight. You see, they don't preach today what Jesus did or what the apostles did and what He taught them. And this is what, this is the instruction of Jesus in sending out His young ministers on this, you might say, practice message of theirs or practice ministry in this tour that they were taking. Now, here's the fifth thing he said or the sixth I guess it is. "Think not that I came to send peace on the earth." They don't preach that today. There again. Everything that you see that Jesus instructed His disciples is exactly the opposite of the way it's being believed and taught today. They have turned the Bible upside down. They have turned the message of Jesus upside down. My friends, when will we quit just believing what we hear? You know something you didn't know, maybe the preacher or maybe some person who is religious, no matter who, they come along and they tell you something and explain it to you. Just the way they explain it, "Oh thanks," you say, "Well, I didn't know that. Well, I'm glad now I know it. I'll believe that." But you don't look in the Bible. Most of you are too lazy or are you? Are you? Now, if you're not, I don't mean you. But if you are then don't accuse me of calling you names now because if you really are, why, I guess you just are, aren't you? So, you shouldn't be angry. Now, He said, "Think not that I came to send peace on the earth: I came not to send peace, but a sword." Did you know that's what Jesus said? I'm just quoting the words of Jesus. It's in your Bible. Now, this is Matthew ten, verse thirty-four, Matthew ten, verse thirty-four. I should have told you where to look before I...I told you always to have a Bible ready when I come on the air. But I forgot to tell you where I am. I've been over this so many times lately; I thought you would already know. Matthew ten, verse thirty-four: "Think not that I came to send peace on the earth: I came not to send peace, but a sword. For I came to set a man at variance against his father and the daughter against her mother and the daughter-in-law against her mother-in-law." I wonder if that's where some of the mother-in-law trouble comes. Not too much of it in this world but it will come from there if you'll follow Christ, I tell you that. "And a man's foes shall be they..." Who? Not of the other church. Not of the world. "A man's foes shall be they of his own household." "A man's foes shall be they of his own household." Now, how did Jesus come to bring a sword? How is it He didn't come to bring peace? I'll tell you why. The world knows not the way of peace and they won't have it. And He did come to bring the way of peace. But it won't cause peace for this reason — that the person who will accept His way which is the real way to peace if people would accept it arouses all the antagonism and all of the persecution of the other people. And I'll tell you who it is that'll persecute you — it's those that profess Christianity because the Truth really hits them. They think they're already saved and they want to be very smug in the satisfaction that they think they're all right — "it was all settled long ago" — so they say. They don't think there's anything to do about overcoming, about growing in grace and knowledge and studying the Bible in continuous prayer to get closer to God all the time and to surrender and yield your life to Him. They don't believe in works. They don't believe in enduring unto the end. They say, "Oh, I am already saved. I was born again." But they weren't because nobody has been born again, my friends, but Jesus Christ. Now, does that, does that astonish you? Do you think I'm a false prophet? Read your Bible and see what it says. You can't find in your Bible, my friends, where anyone has already been born again as Jesus was. He's the Firstborn of many Brethren. We're to be born like He was by a resurrection and that which is born of the Spirit, is Spirit. Do you know anyone who is spirit? Now, Jesus said, "All who would live godly in Christ Jesus [or was it Paul who said this?] shall suffer persecution." "All who will live godly in Christ Jesus shall suffer persecution." I am reminded so often of the minister of a very popular downtown church in a certain city who broadcast his Sunday morning service the whole church service for an hour and a half on radio some years back and he had a lot of empty seats. And the attendance was not increasing, it was rather going down. He had plenty of members but they just didn't come and fill the vacant pews. And the preacher was very disturbed. And so one Sunday morning and I heard it over the air in my car as I was on my way to another city to broadcast and he said he couldn't understand it. He said, "Now, if you were persecuted for your belief and your religion there might be some excuse for not coming then you might have a reason. But he said, "I dare say, that not a single member of this church has ever been persecuted for his belief or his membership in this church. Why," he says, "The world respects us. They look... This church is respected. And all the people respect us." You know Jesus said, "Woe be to you when...men [think] well of you." Now, men thought well of them in that church but that isn't the kind of a gospel that Jesus taught. How about your church? Yes, "a brother shall deliver up brother to death," said Jesus, "and a father his child." You know why there isn't more of that being done today? There aren't enough people that really believe the Gospel of Jesus Christ. They'd be persecuted more if they did. "And children shall rise up against parents, and cause them to be put to death." Now, that time is really coming. That was prophetic and it did come once upon a time back there and it's coming again in our time and in our generation. There is a martyrdom of saints that is coming. And I tell you this is prophetic. This will happen. "And ye shall be hated of all men for my name sake: but he that endureth to the end the same shall be saved." You don't hear much of that kind of preaching today. "And when they persecute you in this city, flee unto the next." You are to flee when they persecute you. "For verily I say, you shall not have gone through the cities of Israel, till the Son of man be come." He's talking about the Second coming of Christ there. I went back to the twenty-second, twenty-third verses there and there it is. Now, he said, "a disciple is not above his master..." Well, if they persecuted Him then as He said elsewhere they will persecute us. Now, there it is. They don't teach those things today. Now, he continued to say down here that, "he that loveth father or mother..." I'm back here in verse thirty-seven — Matthew ten (I think it is) verse thirty-seven. "He that loveth father or mother more than me is not worthy of me: and he that loveth son or daughter more than me is not worthy of me. And he that doeth not take his cross, and follow after me, is not worthy of me." Now, we don't all have the same cross. Jesus did have to carry His cross. It was the custom that they always made a man condemned to be put to death by being nailed to a cross, he had to carry his own cross — it was custom. There's been some dispute as to whether Jesus carried His own cross, but He did. And He said here, our cross may be the persecution of others in the family. Our cross may be that we have to give up former friends and associates. Do you know? We are told that if we have fellowship and friendship with the world we'll be the enemy of God. And I've seen that happen so often. A person who has really converted, my friends, will probably have to give up his former friends and associates even members of his own family. Now, they won't understand it. They'll get sore. They'll say, "You're just high-hatting me." They are not going to understand it. But I tell you, they are not interested in things that a person who has really been converted and who really has been begotten of God, he isn't really born again yet. What they call born again is really a begettal. There's just a little misunderstanding on the term, that's all. But if they endure, if they grow in grace and knowledge and if they overcome and grow more like Christ and Christ is living in them they shall be born again. Now, they can't participate in the same pleasures and the same activities as the people of the world, they're not interested in the same things. And I've known of a case recently and...where the one who had been converted, he wanted to talk about the Bible, but his people in his own family that he had known, they wouldn't talk about the Bible, they wanted to talk about worldly things that he had to get out of his mind. Well, they just said, "You're just high-hatting us." They couldn't understand. Yes, a man's foes will be they of his own household. And they're the ones who are going to be condemned in the judgment, but of course now they condemn the one who follows Christ. Always it's that way. "He that loveth father and mother more than me is not worthy of me: he that loveth son or daughter, brother or sister more than me is not worthy of me. And he that doeth not take his cross..." That's the cross some of us have to bear. It might be any kind of a cross — a trouble, a persecution, whatever it may be. "He that findeth his life [you're just going to try to have it easy now and the original is his soul] shall lose it: and he that loseth his life [or his soul] for my sake shall find it." You know the soul is something you can lose; it's something that can be destroyed. Advertisement Because of the importance of this subject and other related topics we are pleased to offer the following free literature. There's a time to be born, a time of youth with its lessons to be learned and its care-free moments, a time to raise a family to watch your children grow and teach them of life, a time for work, for productivity and doing your part for mankind. There's a time to grow old and enjoy your grandchildren. And there's a time for death at the end of a full exciting life. Then what — Heaven, Hell, Reincarnation — what is the answer to this question that has long bothered man? You need to know. Read this free booklet — "What Is the Reward of the Saved?" It answers this question in a unique and surprising manner. The Bible nowhere promises what you've always assumed. Be sure to read this informative booklet, "What Is the Reward of the Saved?"